Chuck roast is a flavorful cut of beef that needs slow cooking to make it tender. Cooking in a roaster oven is convenient because it is portable. You can plug it in the garage, for instance, if the weather is hot or your kitchen cramped. It's also useful if you need your conventional oven for other foods that must be cooked at the same time. Roaster ovens have an advantage over slow cookers -- a thermostat that lets you choose the cooking temperature. Preheat the roaster oven at 300 degrees F for 15 minutes with the lid on. Meanwhile, pat the roast dry, rub half the oil over the surface and season with the salt and pepper. Brush the inside of the roaster insert with the remaining oil. Place the roast in the roaster and brown while you prepare the vegetables. Turn the roast over to brown the other side after 4 or 5 minutes. Prepare the vegetables. Remove the roast from the roaster, spread the onions on the bottom of the roaster. Nestle the carrots and celery in the onions to make a bed for the roast. Place the bay leaf on the onions and replace the roast. Pour the beef broth or beer around the roast. Place the lid on the roaster and make sure it fits tightly. Cook the roast at 300 degrees F for 15 to 30 minutes per pound, depending on whether you want rare, medium or well-done beef. Cook for 3 to 4 hours total for a well-done roast; the meat should fall apart when done. Use an instant-read thermometer to check for doneness. 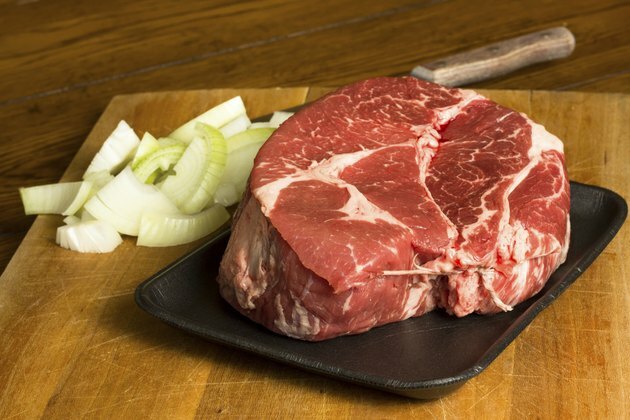 For rare meat, cook the beef to 140 degrees, for medium 160 degrees and for well-done 170 degrees. Remove the roast to a serving platter. Cover with foil and let it sit while you make the gravy. Strain the pan juices into a measuring cup and put them back into the roaster. Turn the heat up to 450 degrees. Mix 1 tbsp. of flour per cup of pan juices with enough water to make a thin slurry with no lumps. Whisk the flour slurry into the pan juices and stir until the gravy begins to thicken. Turn off the heat and pour out the gravy, using oven mitts to protect your hands. Use the cooking insert; don't put ingredients directly into the roaster. Add eight potatoes around the roast, if you want them cooked in the pan juices. The roasting oven gets hot to the touch; always use oven mitts. Every time you take the lid off, the roaster loses heat, so try not to open the lid until the roast is nearly done. Start checking the temperature after 2 1/2 hours to 3 hours, depending on the desired doneness. Chuck roast cooked to medium can be tough. Rare chuck roast or very well-done chuck roast turns out better.